Biscuits looks super cute and prefectly done. 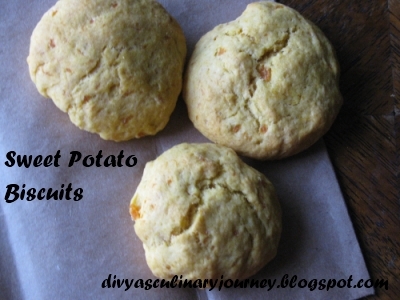 nice idea to add sweet potato in these biscuits!! Good one..and nice to know your lil one was ready to grab! Very interesting recipe! I have few sweet potatoes left so maybe I should try baking these...looks great! Loved the pic where your little tries to grab one...so cute! Chooo chweet,lil one grabbing the biscuit...Never thought of using sweet potato in biscuits! 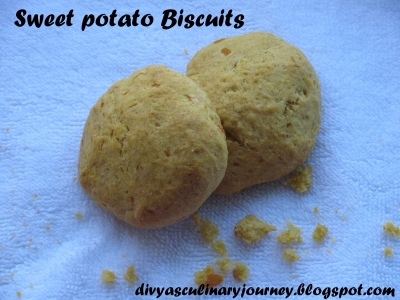 Good one Divya...sweet potato in a biscuit even my kiddos will scorn at it...but the idea is so new and super healthy. 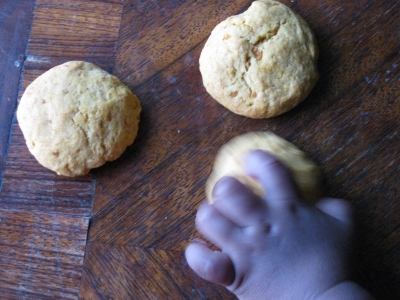 Love those little fingers grabbing the biscuits. Lovely biscuits with sweet potatoes. nice and innovative recipe..crisp and perfectly baked biscuits.. I never thought of sweet potato biscuits. I would love to try these, since I LOVE sweet potatoes. I hope to give these a try soon. Would be great this time of year!